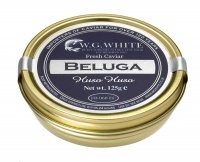 Beluga caviar has always been considered the most prestigious caviar variety because of its rarity and the considerable size of the egg; not less than 3.5mm. This superb caviar comes only from fully mature 20 year old Huso Huso sturgeons. The large steely grey eggs have a wonderful soft creamy texture and a subtle taste with a hint of walnut. Its thin membrane synonymous with only the best caviar in the world. 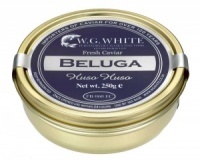 Beluga Caviar was originates from the Beluga Sturgeon Huso Huso area's around the Caspian sea and is synonymous with being the finest and most exspensive food in the world. First believed harvested by Turks the caviar started to become popular in Western Europe in the mid 16th Century. 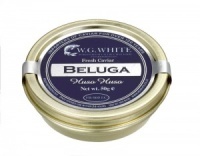 W.G Whites Beluga Caviar is harvested from 20 year old fully mature Huso Huso Sturgeons and the steely grey eggs have a wonderful soft creamy texture and a subtle walnut taste. Like other Caviar Beluga is best served with as few embellishments as possible to ensure the delicate texture and taste can be appreciated in full. One of the most popular and traditional ways of serving Beluga Caviar is on a Mother of Pear dish and spoon along side ice cold Russian Vodka. Taking over 15 years to mature to reproductive age, and only reproducing every 3-4 years, the wild Beluga Sturgeon Huso Huso is listed as a critically endangered species by Convention on International Trade in Endangered species (CITES). It has been illegal to trade in Caviar harvested from wild Beluga Sturgeons since the early 2000's. At W.G. White we are proud to have been working with the only Caviar farm in Europe to have been awarded a Friends of the Sea's certification to source our sustainable Beluga Caviar for over a decade.